Bangladesh, the southern Asian country has a population of approximately 164 million people. The economy of Bangladesh is significantly dependent on agriculture. But its a great news for the country that, readymade garments (RMG) sector of Bangladesh has raised as the biggest earner of foreign currency. This sector creates about 4.2 million employment opportunities and contributes significantly to the GDP. Readymade garments (RMG) of Bangladesh is powered by young, urbanizing, workers, where most of them are women. In the earlier stage, Riaz Garments of Mohammad Reaz Uddin started its business with some tailoring shop in the name of Riaz store. In the later, the name turned into Riaz Garments from Riaz store in 1973 and from 1978 the company started exporting products in the abroad by exporting 1 million pieces of shirts in the South Korean Company named “Olanda”. “Desh Garments” is another pioneer of Bangladesh RMG sector. In 1979, Desh Garments started a joint project with South Korean company “Daiyuu”. At the same time, several garments were introduced such as-Stylecraft limited by Shamsur Rahman, Aristocraft Limitd by AM Subid Ali, Azim Group by Engineer Mohammad Fazlul Azim and Sunman Group by Major (Retd) Abdul Mannan. In RMG sector of Bangladesh, there are more than 5000 garment factories (private statistics) at the current time, employing more than 12 lack labours, where 85% of the labour force is women. But, according to BGMEA the number of garment factories in Bangladesh around 4000. Now, RMG industry is the countries largest export earner with the value of over $24.49bn of exports in the last financial year. Its a great news for us that, Bangladesh is clearly ahead from other South Asian suppliers in terms of capacity of the ready made garments industry. Though, there are various types of garments are manufactured in Bangladesh, but all the ready made garments are classified into two broad categories, where one is woven products and another one is knitted products. Woven products includes Shirts, Pants and Trousers. On the other hand, knitted product includes T-Shirts, Polo Shirts, Undergarments, Socks, Stockings and Sweaters. Woven garments still dominates the export earnings of the country.From BGMEA website its seen that, Day by day knitted items production is increasing in considerable rate and now about 40% export earnings has achieved from knitted products. The role RMG sector in Bangladesh economy is remarkable. It’s seen that, from the last decade, RMG sector contributes to the national economy in considerable rate. 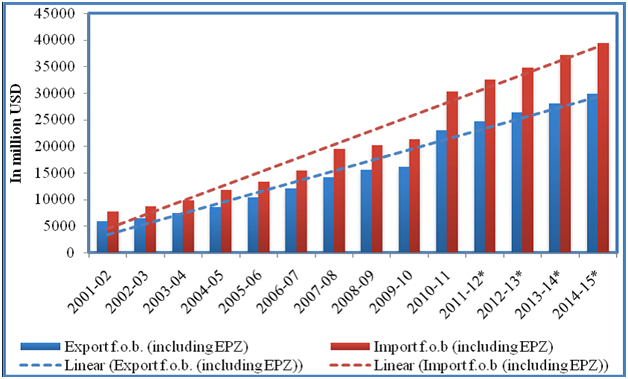 About 76% of total export earnings come from RMG sector. From a statistics it’s known that, in FY 2003-04 RMG sector of Bangladesh earned US$ 5,686.06 million, in FY 2004-05 the value was US$ 6,417.67.67 million, in FY 2005-06 the value was US$ 7900.80 million, in FY 2006-07 the value was US$ 9,211.23 million, in FY 2007-08 the value was US$ 10,699.80 million, in FY 2008-09 the value was US$ 12.35 billion and finally in FY 2013-14 the value stands at $24.49billion. RMG sector of Bangladesh has some key factors which inspired for steady growth of this sector. Though its a matter of great surprising for so many that how RMG sector of Bangladesh continues to show its robust performance in the world. And international supports like GSP, GSP+, duty free access etc. By using the above key points we can easily take place the world”s readymade garments market very strongly. But there”s some another key factors. If we apply those key factors in our readymade garments sector, then we will achieve the first priority to the worlds famous buyers note book. Cost reduction strategy should begin with assigning the highest priority for establishing backward linkages. The establishment of backward linkages will reduce our dependence on foreign sources which will reduce the total and average production cost of garments. This Strategy will make our products more competitive in the world’s ready made garments market. Bangladeshi workers are not efficient as of Hong Kong, South Korea and Sri Lankan workers. Wages are low in Bangladesh, but it does not necessarily mean that relatively low wages workers automatically lead to higher productivity. So, to keep place in the worlds largest competitive market, labor productivity must be improved. Its a matter of great sorrow for us that, we are regularly produced the same products. Our product categories are very less in quantities. Our product items that are exported into foreign market are Shirts-60%, Jackets-11%, Knit items-10%, Trousers-7% and Others-11.50%. To survive in the worlds most competitive RMG market, we have to develop new product items with a lot of variations. Product Diversification Strategy is an important factor to keep place in the worlds ready made garments market. Different types of products should be produced by applying fashion. Thailand, China, India, Pakistan, Hong Kong, Singapore, Malaysia, Indonesia and others are the main competitors of Bangladesh. They are already ahead of Bangladesh in product diversification strategy areas. Bangladesh has exported their products in the worlds limited market. Mostly are in USA, Canada and Europe. About 46% of its total garment exports goes to USA, 14% to the Canada and rest of those into the European market. The competitors of Bangladesh are regularly expands their markets and keep changing their products by using fashion. Human resources development by providing training. Though RMG sector of Bangladesh has achieved the second spot for the highest number of garments exporter, but it has a lot of problems. The major problems faced by RMG sector currently is the lack of safety in working place and working conditions for the millions of garments workers. It’s become a great challenge for the upcoming financial year of Bangladesh. Another important one is political stability. Two major incidents in RMG sector of Bangladesh are the Tazreen fire and the Rana Plaza collapse, which have brought the issue of workplace safety to the fore and led all stakeholders to act accordingly. But it’s good news for RMG sector that, following the unfortunate incidents, various platforms such as the Bangladesh Accord on Fire and Building Safety, the Alliance for Bangladesh Worker Safety and National Plan of Action have been formed to improve building and fire safety of Bangladesh’s garment industry. Also BGMEA and BKMEA are working together here to solve such kinds of problems. They have also taken necessary actions and invested huge amount of money. It’s a huge responsibility for the government of Bangladesh to ensure working place safety in all the garments manufacturing factories. If we can’t do it, foreign buyers will refuse to place order here, which will be a massive blow for RMG sector of Bangladesh. We hope, the government of Bangladesh, BGMEA and BKMEA, with the support of global brands and international development partners, will be able to ensure the safety of the RMG industry and maintain the momentum of socio-economic development in the country. Political stability creates a negative impact on RMG sector of Bangladesh. If it continues, it will be a massive blow to destroy our most valuable sector. So, political leaders should come out immediately to solve such kinds of problems. According to the McKinsey survey, it’s seen that 86 percent of the chief purchasing officers in leading apparel companies in Europe and the United States planned to decrease levels of sourcing in China over the next five years because of declining profit margins and capacity constraints. 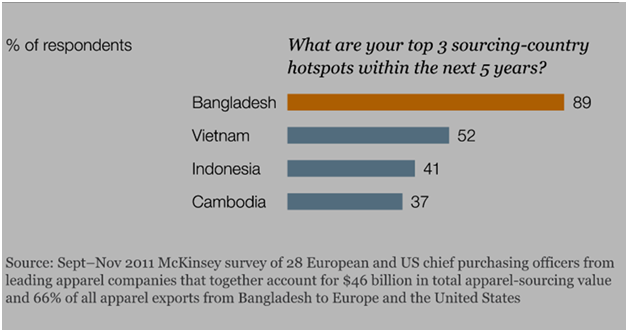 Also they said in that survey, “Western buyers are evaluating a considerable number of sourcing options in the Far East and Southeast Asia, many chief purchasing officers said in the survey that they view Bangladesh as the next hot spot”. Many chief purchasing officers mentioned Bangladesh as the hot spot in the readymade garments market. McKinsey survey also reported that, with about $15 billion in exports in 2010, ready-made garments are the country’s most important industrial sector; which represents 13% and more than 75% of GDP and total exports, respectively. McKinsey forecasts, export-value growth of 7 to 9% annually within the next ten years, so the market will double by 2015 and nearly triple by 2020. It’s a prime duty for us to provide a perfect working place for the readymade garments sector of Bangladesh which has given our economy a strong footing, created jobs for millions of people, especially for women, lifted them from the abyss of chronic poverty and given them a magnificent life. Now what we have needed to do is dealing with all the challenges facing our readymade garments industry, paving the way for its further development. It is so good to produce various garments from this RMG sectior & Bangladeshi people will be strong from their bright future in this section. It is really a good post i ever seen. As I am a garments machinery & spare parts importer , i can assure that this article is so much helpful for me along with my good Success. Thnaka for sharing very helpful article.